STOP BUYING COMMERCIAL BEAUTY PRODUCTS. 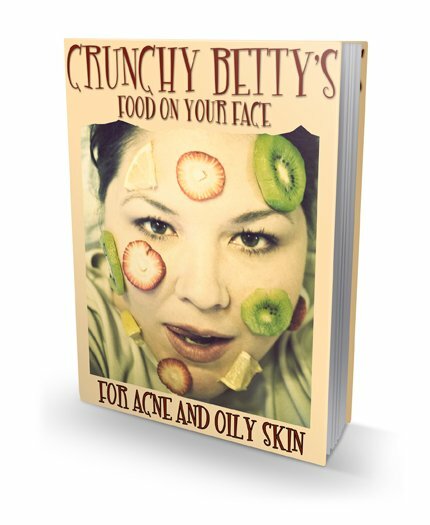 Crunchy Betty’s Food on Your Face for Acne and Oily Skin is here to save your face, save your budget, and save your skin from nasty chemicals found in traditional beauty products. It’s not just a natural beauty ebook – it’s a complete system designed to clear your skin and leave behind dewy, clean beauty you OWN. 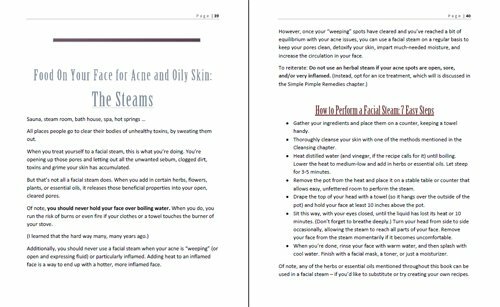 Within the pages of this all-inclusive PDF ebook, you’ll immerse yourself in all-natural cleansers, steams, masks, moisturizers and SO much more. There’s no other natural beauty book like it, tailored just for acne and oily skin. 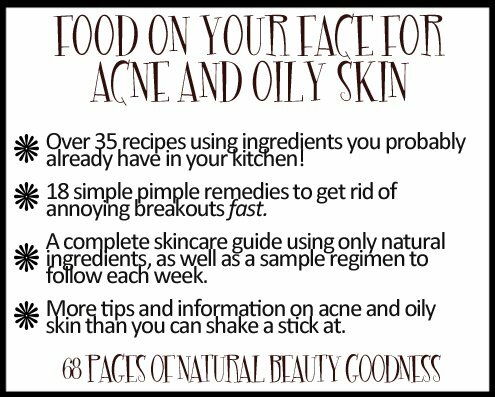 Instead of wading through recipes that won’t work for your special skin type, you’ll have 35+ recipes only you need for beautiful, healthy skin. If you’re ready to dump the commercial products now and look in your own kitchen for the answers to glowing, clear skin, click the buy now button. Or, if you want more info on what this book will give you, keep on reading! Want to read it on your Amazon KINDLE? Click here to buy it from Amazon. Think Food On Your Face is Weird? I’ve been dabbling in natural beauty recipes for over 4 years now, and have nearly 2 years of direct experience blogging about this exact subject. In these 2 years, one thing’s become exceedingly clear: There is absolutely no reason for you to buy bottles of skincare products (containing who knows what ungodly chemicals) to have beautiful, clear skin. Not only have I dramatically reduced the amounts of pimples I get (to the tune of maybe one small pimple a month) and completely tamed my oily skin, but I’ve watched as literally HUNDREDS of other women have done the exact same thing. It’s a revolution. It’s taking back your personal power. It’s putting food on your face, and loving every last second of it. This e-book is for you if you’re tired of spending money on skincare products that don’t work as well as you think they should (and, in fact, are probably making your acne and oily skin WORSE). It’s for you if you’re ready to discover the whimsical fun of creating your own beauty products – in your kitchen. And it’s for you if you’re tired of scouring the internet for options that might work, but you’re just not sure. This book is full of sure-fire remedies to tame your acne and return your skin to its natural beauty. TONS more information you don’t have to dig around the internet for hours in search of – and you don’t have to wonder if they work; I’ve done all the testing for you, AND I’ve received hundreds of glowing emails and feedback on specific recipes and regimens in this book. Ready to Buy Food on Your Face for Acne and Oily Skin? 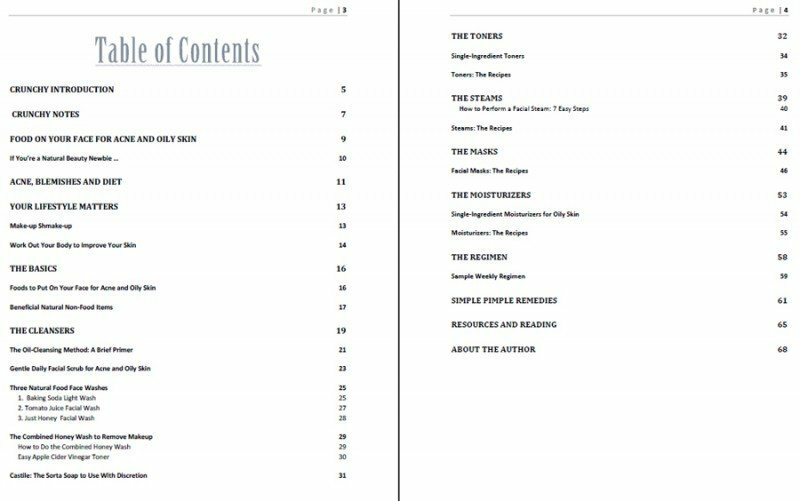 All in a beautiful 68-page PDF file you can read on your computer, or easily print off for your reading pleasure. BUY the digital ebook NOW for $7.99. “I think the number one thing that struck me after I finished reading the book was just how easy all of the recipes are. I always thought going green would be complicated and expensive, so my laziness prevented me from making the jump for a long time. The first thing I read on your site was the honey challenge, and it totally sucked me in. I mean, it doesn’t get any easier than putting one (readily available) ingredient on your face and washing it off with water! It continues to amaze me that all of the ingredients used in your book are not only all natural, but WAY cheaper than all those crazy chemical commercial products – even the most expensive oils. I am definitely head over heels, never turning back, in love with being crunchy!” – Amy Z.